Well, dear readers, Fall is nearly upon us—which means it’s time for another Budds’ news round-up. Here’s what Chevy, Cadillac, Buick, and GMC have been up to lately. Sounds like a blast. And, as it turns out, it is—especially with a Chevy Bolt. Here’s a deep review of the 2017 Envision, from the Halifax ChronicleHerald, of all places. Spoiler alert: they call the Envision “well thought-out” and “pleasantly refined,” among other things. But it’s not just a review—the article also contains some interesting introductory information on Buick’s success in China. Worth a read here. Calling this Escalade “lifted” is like calling Arnold Schwarzenegger “physically fit”—there’s got to be a better word. See for yourself at The Drive. So if you’ve been thinking about a new luxury drive for next summer but you’ve been holding on the Escalade because… well, because “you just can’t do that”—maybe you can. Have a quick read—and make sure to check out the video—on the Car and Driver site. They say your first time is special—and yes, before you raise an eyebrow, we’re talking about the first time you buy a car. Finally, here’s a fascinating article on the art of designing cars—a process that requires prototype after prototype. But why do they make those prototypes in clay? “Car companies have tried other materials, like plaster. They’ve tried designing cars on computers. 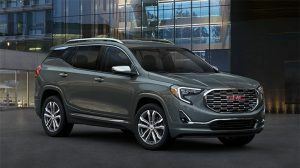 But without the hand-sculpting process, designs tend to look stiff and stale, said Bob Boniface, the design director for global Buick exteriors at General Motors Co.
We can see the headline now: Area Car Fan Finds New Ride at Oakville’s Best Dealer. If that appeals to you, let us know, newsmaker.